Successfully Added 1080p Camera - CMOS Sensor, 128GB SD Card, IP66 Waterproof, 50m Night Vision, P2P, 4G Wireless, 4 Alarm Areas, App Support to your Shopping Cart. Significantly increase the security of your home or office with this 1080p security camera. With its 1/2.9 Inch 2MP CMOS sensor from Sony, this security camera is capable of putting forth detailed Full-HD footage. Thanks to this, you can be certain that nobody will ever be able to approach your property unseen again. 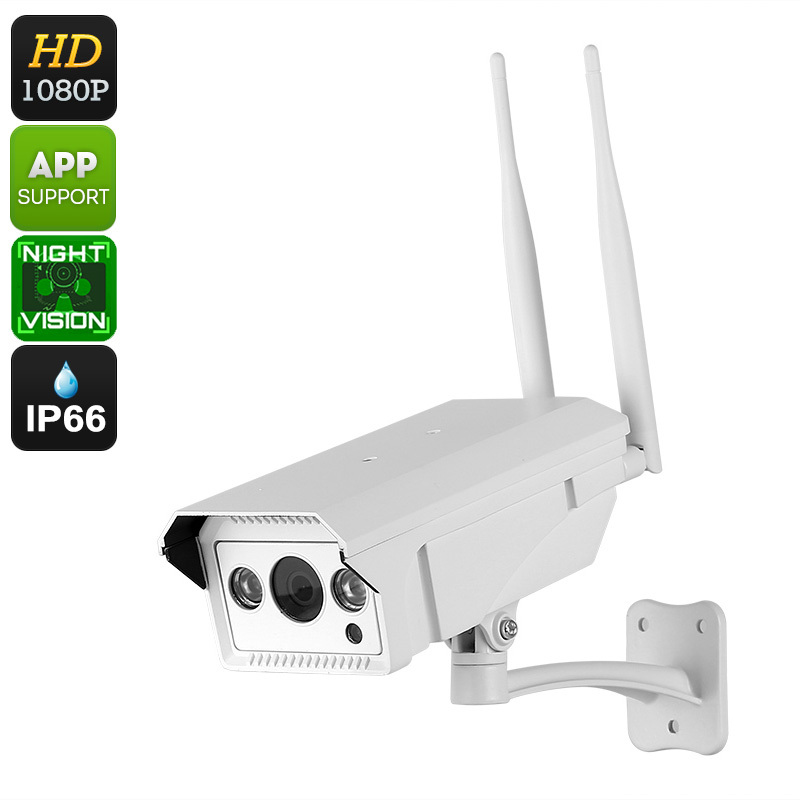 With its IP66 waterproof design; this security camera can be used safely in indoor and outdoor environments. The camera supports 4G mobile connectivity. Therefore, you’ll be able to access your security camera from afar even when you use it outdoors. With its App support, it treats you to remote access on both iOS and Android phones. This outdoor security camera supports a stunning 50 meters of night vision view. Thanks to this, you can be guaranteed that your property is secure around the clock. The camera comes with an SD card slot that supports up to 128GB of files. Therefore, you won’t have to worry about storage for any of your security footage anytime soon. Your security camera supports 4 detection areas. Whenever its alarm has been triggered, your Full-HD security camera will automatically store the footage onto your SD card. Additionally, pictures will be sent to your mailbox and an alarm message will be sent to your cell phone (note you must use a SIM card for this functionality). Thanks to this, you’ll always be informed when there has been a breach of security.